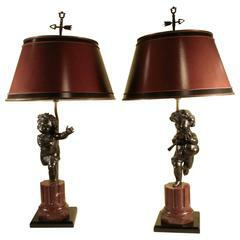 A wonderful pair of French dore bronze winged cherub / putti figural sculptures holding torches converted into lamps. 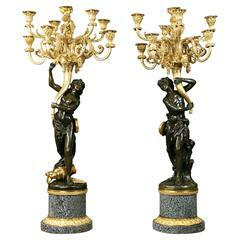 A wonderful pair of Cherub doré bronze / putti figure pierced candelabra with ormolu mounts raised on marble bases. 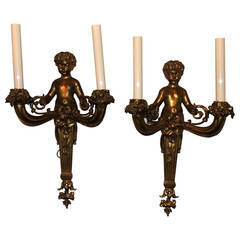 A wonderful sweet pair of French gilt doré bronze cherub or putti ormolu-mounted swag on marble base candlesticks holding a basket candleholder Measures: 11" H X 4" W.
Stunning four arm heavy bronze wall sconce with woman with wings as central theme. 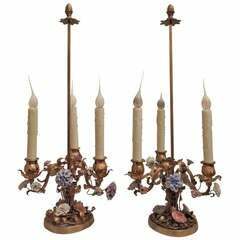 Nothing short of gorgeous.